A Review Of Local Author Gary Highfield's "When 'Want To' Becomes 'Have To'!" Gary Highfield holds in his left hand a pair of old boots he wore as a young man while trying to make a better life for himself and his family. In his right hand are his first pair of high-quality business shoes, which he still sometimes wears today. Each pair of shoes holds a story for the Chattanooga native incorporates into his book, “When ‘Want To’ Becomes ‘Have To’!,” which this fall outsold books by noted authors like Stephen King and others at Barnes & Noble at Hamilton Place. It's not often that a first-time author finds his fledgling book outselling Stephen King, but that is exactly what happened to Chattanoogan Gary Highfield earlier this fall. His book, When Want to Becomes Have To!, held the No. 1, 2 and 3 positions at Barnes and Noble on Hamilton Place Boulevard Sept. 14-Oct. 14 and is “still selling in the top 10,” according to the author, who notes that, to date, over 600 of the books have already been sold, including via Amazon.com. A local resident and corporate sales consultant who started climbing the ladder to success at Cellular One of Chattanooga in its infancy, Mr. Highfield has already seen the success of his book open doors for him to speak at colleges and high schools about his book's theme – “breaking chains” that hold back individuals from using the talents they have been given. The author, who was born in Chattanooga and spent his teen years growing up in Tyner, writes about his frustration as a student and athlete in junior high and high school, having won the city's wrestling championship in his weight class but never receiving compliments from the coaches, who also coached wrestling and were angry with him for quitting football. He explains that he played football for a while, but because he had to walk five miles home from practice every evening on a route that passed right by a jail, he eventually grew more weary and fearful as the daylight hours grew shorter. Then on page eight, the author laments, “I've only talked to my dad once in this lifetime. After I was grown and married, he called to say he was planning to come to Chattanooga to see mom and me. …But it never happened. I never heard from him again after that one and only phone call.” About ten years later, he continued, “I got a phone call from a cousin on my father's side of the family letting me know my dad had passed away.” He was only 57 years old. Later in his book, Mr. Highfield writes about his early life after graduating from school, getting a job and getting married and then running into a brick wall in his pursuit to achieve a better life for his family as a blue-collar worker. He explains that he was denied a $1 an hour raise by his employer, was turned down for food stamps because he made 33 cents a day too much to qualify, and was fired from his first job because he did it too well. It was this frustrating experience, he further explains, that motivated him to overcome his fear of the unknown, his lack of professional job experience and his lack of marketable people skills. Great people can be great teachers, he says, referring to numerous quotations in his book from successful people that have proved especially helpful during his life and career journey. 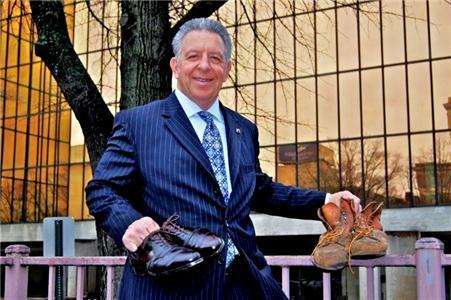 On the cover of When Want To Becomes Have To, which was edited by Chattanoogan Bob Tamasy, is a photo of a pair of old, worn out work boots and a pair of new dress shoes. The boots are the ones Mr. Highfield wore for many years as a young man struggling to make ends meet; the dress shoes are the ones he wears today as a successful businessman. His wish is for everyone trapped in old boots to be free and walking someday in shiny, new shoes. “If you have any chains that you need to break, you need to read this book,” said Kelly Flemming, manager, Chattanooga Barnes and Noble bookstore, Hamilton Place Boulevard.